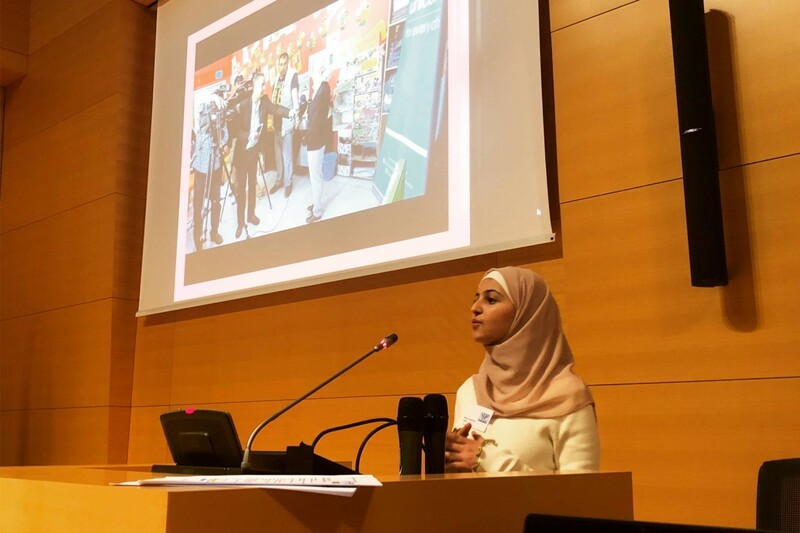 UNICEF Luxembourg and the International School of Luxembourg (ISL) had the pleasure to welcome UNICEF Goodwill Ambassador Muzoon Almellehan to the Global Issues Network Conference as one of the keynote speakers. The conference, is organised, led and compered by 16 ISL students on 28, 29, and 30 March at the Chambre de Commerce du Luxembourg. Its purpose is to empower young people to collaborate locally, regionally, and globally in order to create sustainable solutions for global issues. The event brings 250 students together from 30 schools and 15 countries and this year focuses on our World’s most vulnerable People, Places and Resources. Muzoon Almellehan, 20, is one of UNICEF’s youngest Goodwill ambassadors. During the conference, she spoke about her personal experience as a Syrian refugee and education activist and her commitment as a youth advocate to make education a reality for all refugee children. “Even as a child, I knew that education was the key to my future, so when I fled Syria, the only belongings I took with me were my school books. It really was education above anything else”, Muzoon explained. According to the Convention on the Rights of the Child, every child has the right to go to school and learn, regardless of who they are, where they are, or how much money their family has. A child’s migration status should never be a barrier to accessing basic services. During the GIN conference many examples of how the students attending, and their fellow students back at school, can commit to the world’s most vulnerable people, places and resources will be illustrated by guest speakers and interactive workshops. The student organisers will host guest speakers from non-profit, and ethical and sustainable organisations, who already actively locally and globally support the world’s most vulnerable people, places, and resources. The speakers will tell their stories and help the students to see how they can take action too. The speakers includeKesz Valdez– a Peace Prize Winner, originally from The Philippines, who was forced to beg and scavenge on the streets at just four-years-old. At the age of eight, Kesz founded Championing Community Children – since then he has helped more than ten thousand children living in slums, distributing clothes, sandals, and toys and teaching children about hygiene, food and children’s rights. Ayesha Keller– the coordinator and founding member of Better Days, a NGO which was launched in response to the refuge crisis in Greece, that is committed to the delivery of humanitarian aid, and has a focus on challenging the idea of space creation in refugee set-ups. Stylianee Parascha– founder of What.Eve.Wears, an ethical and sustainable fashion start-up in Luxembourg with a social entrepreneurship structure. Harrison Wavell– Schools and Colleges Programme Manager at the Ellen MacArthur Foundation.Harrison supports a growing community of educators looking to inspire their students through the vision of circular economy. At the beginning of the conference students share updates on the Action Plans they made last year, and at the end of the conference, and following all of the inspiring and thought-provoking conversations and workshops they have had, the students present their new or updated Action Plans with their commitments. GIN was founded 16 years ago at the International School of Luxembourg and has since become a global phenomenon with over 100,000 members spanning five continents. Over 500 GIN projects have already been implemented thanks to the grassroots idea and enthusiasm of students around the world. Due to its success the annual conference attracts a whole host of people, this year it includes – visiting students from China, Indonesia, The Dominican Republic, The United Arab Emirates, The United States of America, The United Kingdom, Italy, Switzerland, Germany, Spain, the Netherlands, Greece and Turkey, high-profile keynote speakers, community leaders, educators, subject experts, and not for profit organisations (NGOs). UNICEF works in 190 countries and territories to save children’s lives, to defend their rights, and to help them fulfil their potential, from early childhood through adolescence. UNICEF is present around the world to help make sure migrant and refugee children are protected and that their rights are respected, by providing lifesaving humanitarian supplies in refugee camps and running child-friendly spaces – safe places where migrant and refugee children can play, where mothers can rest and feed their babies in private, where separated families can reunite. UNICEF supports national and local governments to put in place laws, policies, systems and public services that are inclusive of refugee and migrant children, address their specific needs and help them thrive.